Garlic bread is an all time favorite for most members in the family. The flavoring has to be perfect though not too garlicky yet it needs to have just garlic for taste. Let me not complicate things. Garlic is very good to treat cough and cold for little kids. If you are having a tough time getting them to eat garlic try this new age snack which has been popularized by the pizzerias. I often use brown bread to make it healthier. 1) Crush the garlic cloves to fine paste. If it has any threads then sieve it out. 2) Using a fork beat the garlic paste into the butter. 5) Sprinkle the cheese on top, you can continue grilling if you would like to melt the cheese. Who will say no to garlic toast, fantastic. 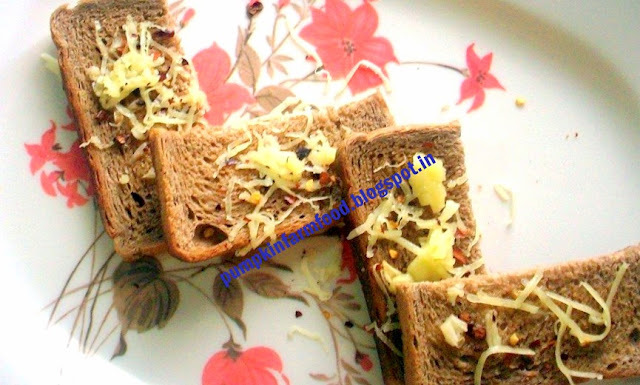 Quick and delicious garlic toast..lovely! That's a quick one..I love garlic bread..
A sure hit with the kids. good one! A good one for kids. Garlic is not my friend :) but I prepare the same way you did for the rest of my family. flavorful, Delicious and a Healthy Toast!!! My all time favorite is garlic toast. Love the fact that you've made it healthier with brown bread. Nice Pradnya!! !